Can my partner teach me to ski? No, get real, book a ski lesson! 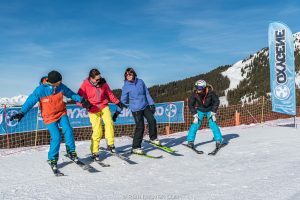 CAN MY PARTNER TEACH ME TO SKI? You can picture the scene. 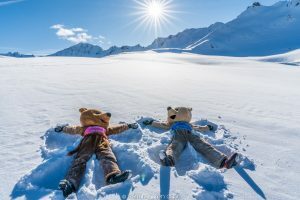 Your partner is a ski enthusiast and wants you to be as excited about skiing as they are so they can book you into their annual pilgrimage to the alps with their friends without feeling guilty. You acquiesce, start to get genuinely excited and go about buying the necessary base layers, ski gloves, jacket, goggles etc. Perhaps you go to a local snowdome or dry slope to give it a go before you hit the real snow. But what about when you get there? Everyone is talking the talk, they can’t wait to get on the slopes and you’re swept along with their excitement whilst feeling a little apprehensive. What if you can’t do it? Your partner reassures you “don’t worry, come with me, I’ll show you what to do”. You get your ski equipment and head for the pistes with your loving partner shouting to his/her friends that you’ll meet them for lunch. You take the lift to the beginner area and before you know it you’re off. Let’s go down here your partner says, it’s a blue slope. The snow is slippery, steeper than expected and you’re sliding all over the place, your partner is trying to remember the way they learned to ski back in the day and starts imparting such wisdom as ‘bend your knees, turn, turn!’ (sound familiar?) You take a few tumbles and being determined to ‘get this’ keep getting up and trying to make those turns all the while people around you (including children who are so small they look like helmets on legs) are whizzing down the slope with grace and style. Your legs start to tire and your patience starts to fade and gradually, this skiing malarkey doesn’t seem like the fun, romantic snowy break that you first imagined. Your partner is getting frustrated and is looking longingly at the steeper slopes above. “Come on, try a bit harder” they say. “I AM TRYING!!! Tell me what I need to do!” Your partner suggests a coffee break to calm things down. Inside you’re both frustrated and neither of you is relishing the thought of getting back onto the snow together. This holiday is turning into a disaster. Take the strain out of your relationship and learn to ski with a pro. So what are you waiting for? Choose a group or private lesson and prepare to make some progress. Then relish the moment where you meet back up with your loved one and can show them your new-found skills before heading off to celebrate together with an apres-ski drink or two.